As gnocchi are known to be ornery, the key to getting pillowy lightness with these Italian dumplings is to add only enough flour to bring the dough together. The first thing you’ll notice with this dish is probably the rich sauce, then you’ll bite into the sublime dumplings. 1. Heat the oven to 400°F. Put the potatoes on a rimmed baking sheet and bake until the skin hardens into a shell but the potato is tender when pierced at the center, about 1 hour. Immediately split them open to let the steam escape. Carefully scoop out the flesh and discard the skins. 2. Bring a large pot of water to a boil and salt it. Working in batches, pass the potato flesh through a ricer or food mill. (You could also use a potato masher, but not a food processor, which will make the potatoes gummy.) Sprinkle with salt and pepper, then taste and adjust the seasoning. Sprinkle about half the flour on a clean counter or cutting board, and gently knead it into the potatoes, sprinkling in more flour a little at a time, until the dough just comes together. Don’t overwork the dough; it’s better to have too little flour than too much at this point. Pinch off a piece of dough, and drop it in the boiling water. If it holds its shape, you’ve added enough flour. If it disintegrates in the water, knead in a bit more flour, and try again; the gnocchi won’t be perfectly smooth and will float to the top when ready. Repeat with as many test dumplings as necessary. 3. Roll the dough into one or several ropes about ½-inch thick, then cut into ½-inch pieces. Make grooves in each gnocchi by gently rolling it along the back tines of a fork; as each piece is ready, put it on a baking sheet lined with parchment or wax paper; do not allow the gnocchi to touch one another. 4. Adjust the heat so the water barely bubbles. Add a few gnocchi and stir gently. Cook, adjusting the heat so the water doesn’t boil too vigorously, until they float to the top. Wait a few seconds, then remove them with a slotted spoon or mesh strainer to a wide, shallow oven-safe baking dish. Cook the remaining gnocchi in the same manner. 5. Heat the oven to 425°F. Line a small plate with paper towels. Put the butter in a small saucepan over medium heat and cook, stirring occasionally, until the butter is golden brown and smells nutty. Remove from the heat immediately and add the sage leaves. Stir; when you can smell the sage and the leaves start to crisp around the edges, transfer them with a slotted spoon to the towels and drizzle the butter onto the gnocchi. 6. 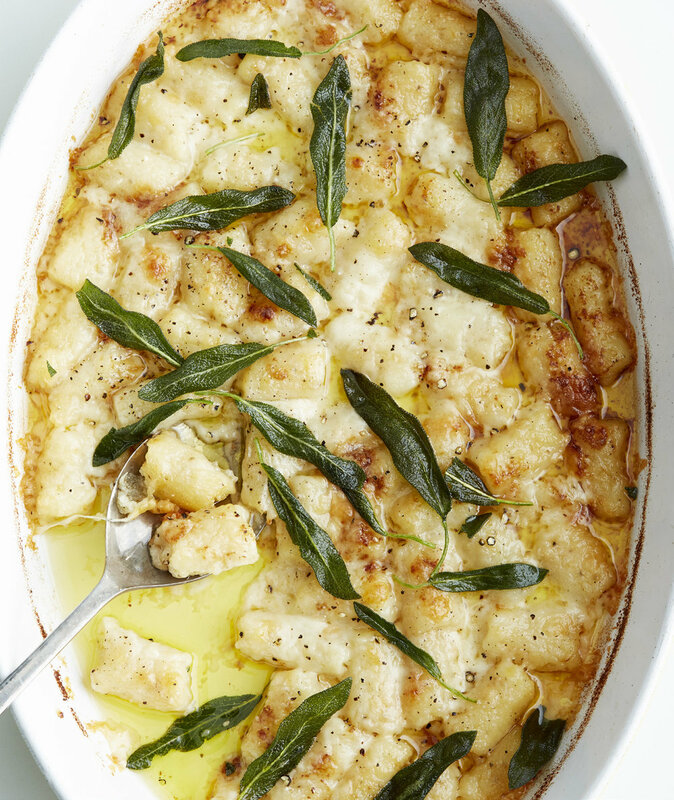 Sprinkle the cheese over the gnocchi and bake until the cheese is melted and browned in spots, 10 to 12 minutes. Garnish with the crisped sage leaves and serve right away.